So begins James Beard’s expansive book of culinary terms, methods, tools, and techniques. 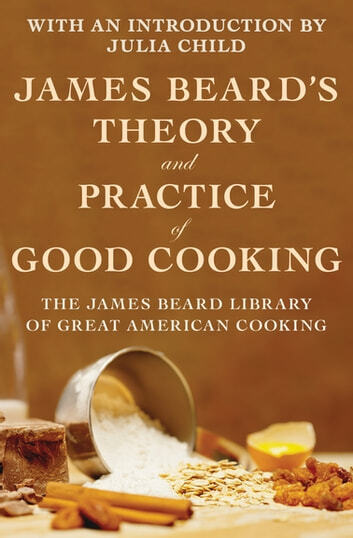 No one knew food better than Beard, and in these pages his timeless wisdom is on full display. Perfect for both seasoned chefs and those just starting out in the kitchen, James Beard’s Theory and Practice of Good Cooking will be one of the most comprehensive and important cookbooks in your library. With a guide to kitchenware, step-by-step explanations of foundational cooking techniques, and more than 300 classic recipes to add to your repertoire, this invaluable volume provides all you need to become a star in the kitchen. Beard’s dishes, from poached pears to steak au poivre, stuffed clams to chocolate soufflé, will delight the senses. And his unpretentious advice, alongside personal anecdotes and food histories, will make cooking a joy.